Thanks for inviting me to be the respondent for this deeply moving and invigorating discussion. I feel like one of the old folks in the room who has become part of the history being discussed, which is great because I see myself as part of a continuum that started from Komagata Maru. It is important to see the episode within the context of what was happening onshore, which continues — we are living in its legacy today. There was a struggle for civil rights in Canada that continued until both Chinese and South Asians in Canada got the right to vote on April 2, 1948. The struggle continues to where we are today, in terms of trying to see equal representation and our rightful place within institutions and within the cultural landscape. In speaking to that, I have been part of this struggle for resolution both as a filmmaker and an artist, but also as an activist working with groups like Canadian Independent Film Caucus. Many of the things that Dana Claxton talked about, were also discussed way back in a conference in 1992 called “About Face About Frame,” which was the first gathering of filmmakers of colour along with Aboriginal artists. As part of the larger context today, we have to remember those long discussions, what happened and what changed. Part of what happened — Indu Vashist mentioned this earlier — is that the country became increasingly conservative. It’s important to recall that part of the process of becoming conservative was the relentless attack on the arts. For example, one of the ways the Reform Party of Canada sought to gain attention in the 1990s was by attacking the Canada Council, picking several projects to focus attacks — and those attacks made headlines. Those attacks continued with the Canadian Reform Conservative Alliance and they continue in different ways with the Conservative Party of Canada. Two more big changes happened: one was in Ontario with the rise of Mike Harris, who completely devastated and decimated the arts; then, in short order 9/11 happened. 9/11 gave rise to a particular kind of reaffirmation of white patriarchy with the undermining of gains made by both feminists and people of colour — a reaffirmation covered over by the notion of the security state. These critical events provide a larger context for what has happened and combine with uber-capitalism and globalization. Also, Paul Wong mentioned how Chinese artists from Mainland China become “hot” at the cost of what is happening here. This is a colonial model that we are reliving within the context of this new empire. Given the context, the work that we do becomes even more important. The work Dana Claxton and Paul Wong did in outlining the earlier organizing work is important — it is important to remember, because part of what gets lost in the current cultural climate is our own cultural memories of the battles that had been fought. 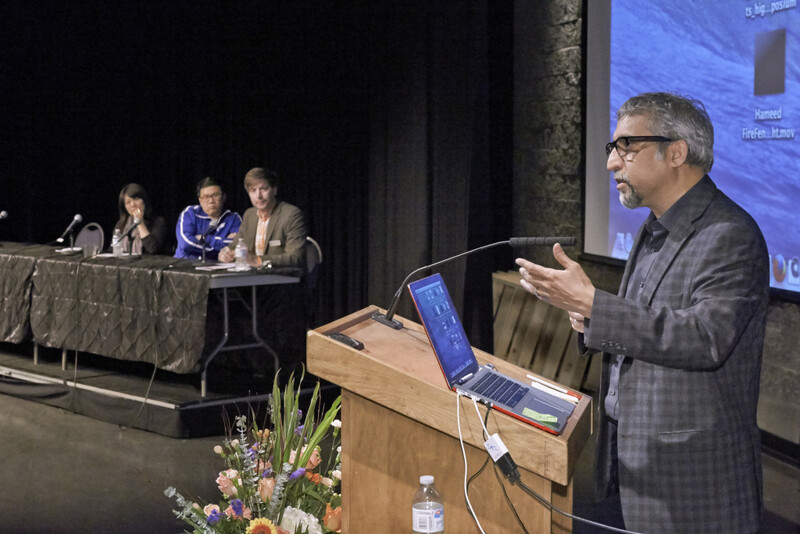 Many important institutions like Reel Asian International Film Festival and SAVAC: South Asian Visual Arts Centre came out of the power of identity politics, and numerous changes happened in Telefilm Canada through that power. Often within the art world, we are our own worst enemy — we divide and undermine ourselves. I share your discomfort when we hear about someone saying, “Oh! That is just identity politics.” I’ve seen people of colour do this as well, and it’s shocking to me. I’m glad that the F-word was used and I am glad the other two words were not used: “political correctness” — which functions as another way of undercutting and undermining discussions of race. These attitudes and terms have often been appropriated, ingested and used by people of colour. This is terminology that was thrown at us by the right with a deliberate agenda to undermine our aims and our gains. We have to be cautious and very cognizant of how we use these words and to engage with them in a way that reflects on historical memory. As an educator of colour, I am constantly reminding my students of colour who often shy away from notions of identity. It is very painful, at times, to see the levels of shame, the shying away and the rejection of one’s own state of being. I have a South Asian student currently who does not want to deal with anything around being South Asian. I have a First Nations student who insists that he is Canadian, while denying his Indigenous ancestry. It is really interesting to see the insidious ways that systems of exclusion play out, re-enter and start affecting young people. So, it is heartening to see a so many young artists here and young panelists who are doing amazing work — you are really inspiring. I would like to thank all of you, and the Surrey Art Gallery for holding one of these rare symposiums around race. These events don’t happen often enough. Such an event has not happened for a very long time, with the exception of The State of Blackness conference in Toronto earlier this year. So, I am glad that my long-standing journey with my film Continuous Journey and the Komagata Maru merges over here with this other part of my life, which is the art world.